Based on Venus Express orbiter data the European Space Agency today announced http://www.esa.int/esaCP/SEM0TLSXXXG_index_0.html that Venus’ “surface features were not quite where they should be”. 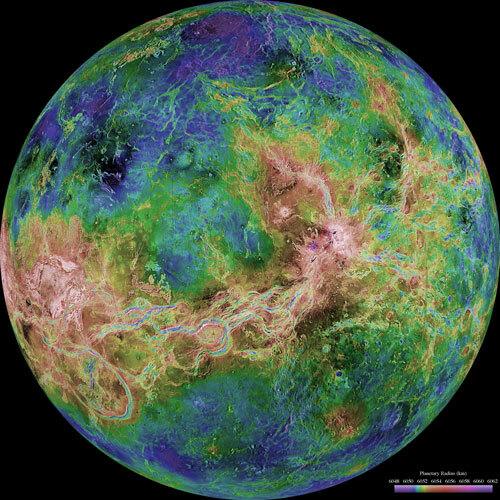 The scientists concluded that the rotation of Venus, measured very accurately by the NASA Magellan radar imaging satellite in the early 1990’s, had slowed sufficiently, in a mere 20 years, to cause a difference of 20 km in the expected positions of surface features. This is a ‘slap in the face’ for the entire planetary science community, whose mantra is uniformitarianism, i.e. the belief that nothing changes in less than millions of years. Overwhelming physical evidence has been present for twenty-five years that Venus is a hot new planet, which we maintain resulted from the high velocity impact (> 10 43ergs) on Jupiter about 6,000 years ago. Up-welling radiation measurements from five independent Pioneer Venus probes all agree that Venus is radiating 250 times more energy than the Earth. The interior is completely molten with a tenuous crust less than a kilometer thick floating on top. 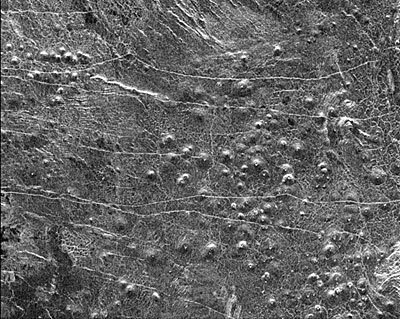 Venus’ enormous internal heat is manifested by raw lava lying in myriads of cracks on the surface and the high velocity jetting of sulfur gases (primarily S8) from some two hundred thousand ‘small domes,’ to an altitude of 48 km. The S8 molecule, the stable form of sulfur at temperatures in the lower atmosphere, was not detected because its mass was beyond the range of the Pioneer Venus instruments. The surface temperature is maintained at 450 C by the evaporation of raining sulfur. The altitude of the ubiquitous lower cloud layer corresponds to the exact temperatures at which the rising S8 freezes to form monoclinic and rhombic crystals, which comprise it. It is the great mass of sulfur suspended in the lower atmosphere (Hadesphere) which produces the high surface pressure, not CO2. CS also crystalizes from the rising gases at 31 km and catalyzes reactions which capture carbon. This caused the dropout of CO2 and CO in the mass spec data between 31 and 50 km, which project scientists attributed to ‘a clogging of the mass spectrometer input leak(s).’ We maintain that the dominant gas in the lower atmosphere is S8, not CO2, and there is no ‘runaway greenhouse effect.’ The great mass of upward jetting gases is what drives the ‘four day’ zonal winds which encircle the planet at all latitudes, in the same direction as Venus’ ponderously slow rotation, for which there is currently no viable hypothesis. The last statement is germane to the new observation that Venus’ rotation is slowing. The transfer of mass in the form of gaseous S8 jetting at high speed directly to 48 km, and consequently angular momentum, from the body of the planet through >200,000 ‘small domes’ is responsible for the measured slowing. Another salient fact, emphasized by the engineers in the Pioneer Venus final report, but ignored by the scientists, was that all four probes, dispersed to different regions of the planet, had their sensors blinded when they descended to an altitude of 14 km (46,000 ft). I maintain that this was due to their being completely coated by the rising S8 which froze on their surfaces. Corroborating this, bared contacts from the ejected heat shield on several probes began to register finite resistances at the same altitude. Venus is a new planet and more probes capable of measuring S8 should be sent to sound the atmosphere. This would be of extreme value because it will show what the Earth was like when it was first formed. It will be found that the lower cloud layer will have shrunk toward the surface in the last 20 years due to cooling, enabling an estimate of when Venus will be safe for humans, because the atmosphere just above the lower cloud layer has earth-like pressure and temperatures. ~ by Angiras on February 10, 2012.